The ducklings are now almost the size of Honey, and since she’s now molting and has shed most of her primary feathers, it’s hard to tell her apart from her brood. The other development is that the “babies” are now testing out their wings, sitting on the duck island and flapping them furiously for long periods. They aren’t feathered enough to fly yet, but their primaries are growing in, and I think they’re exercising their wing muscles. This must be instinctive, for surely they don’t know they can fly. What a sensation it must be for a duck to take off for the first time! I can’t imagine—and we’ll never know—what that feels like to them. And how marvelous that at some point, they’ll just flap and take off! Honey (right) with three of her brood. 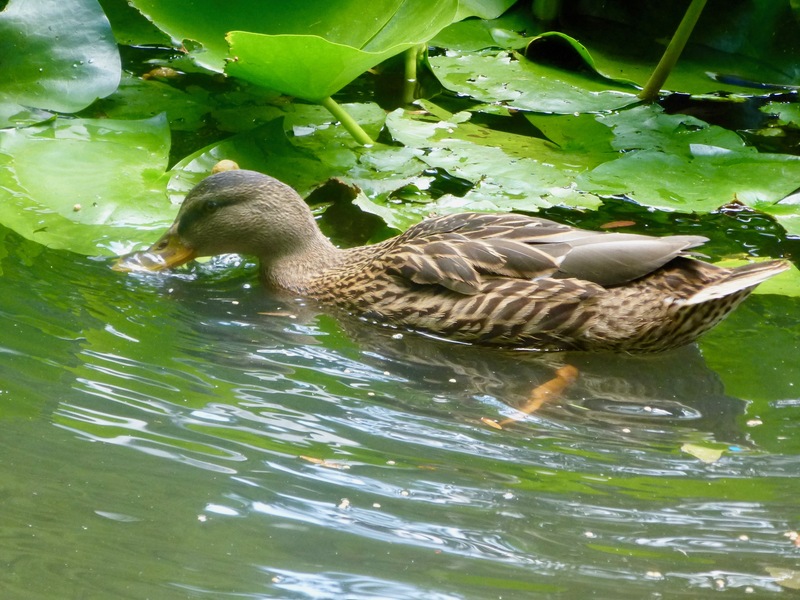 They’re about as big as she is now, and only her white-ish tail and beak mottling, as well as her position (standing guard, swimming either in front of or behind the ducklings) are obvious identifiers. The gang gathered for breakfast this morning. Can you spot Mom? Note the turtle at upper left along with a feather floating by it. 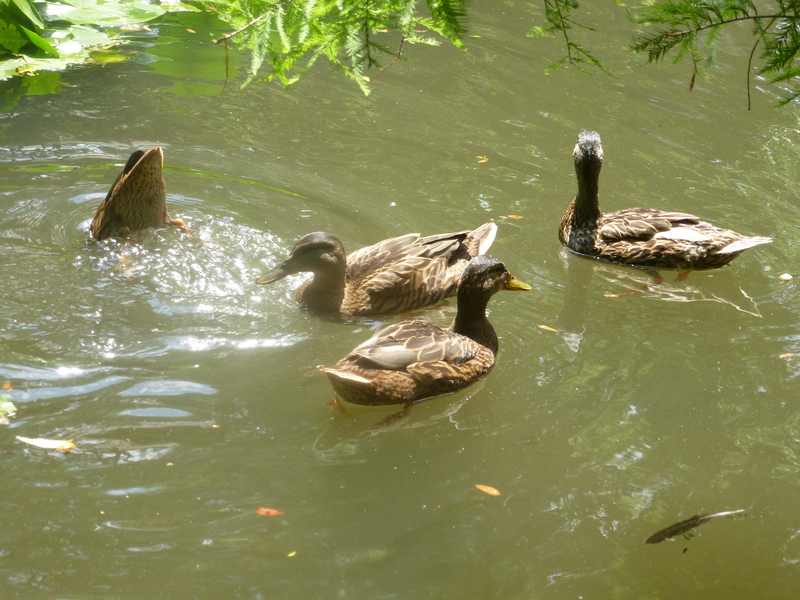 The duck at the extreme right has its beak open. This entry was written by whyevolutionistrue and posted on July 16, 2018 at 2:30 pm and filed under ducklings, ducks. Bookmark the permalink. Follow any comments here with the RSS feed for this post. Both comments and trackbacks are currently closed. Time to start photographing the nine beaks soon? Isn’t Mom’s neck considerably longer than the chicks’? Seem like she stands about 1/2″ taller. I’d like to see a video of the young ducks furiously flapping. It is interesting to think of the sensation they might have when they go from just flapping furiously to starting to lift off the ground. 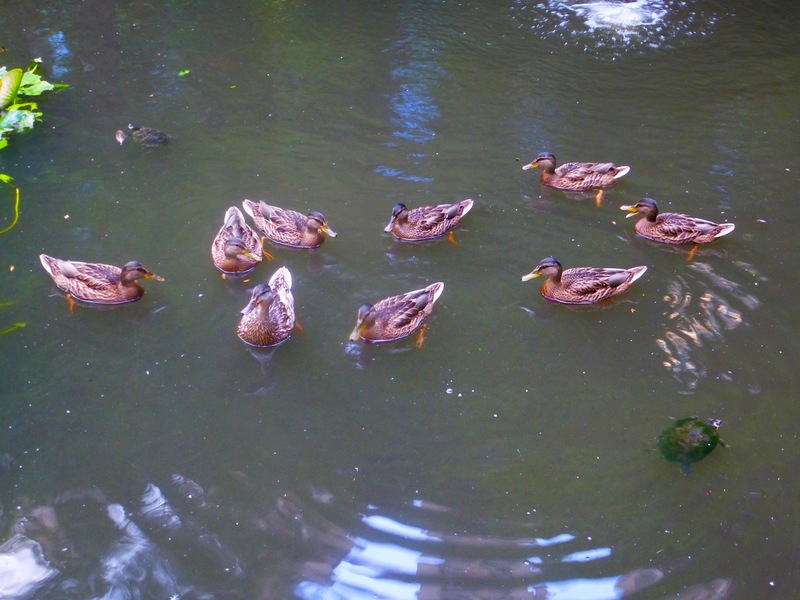 It’s lovely to see how the ducklings grow and change over time. And they all look so healthy and happy! That’s down to you Jerry, making the effort every day, even when you’re not well. 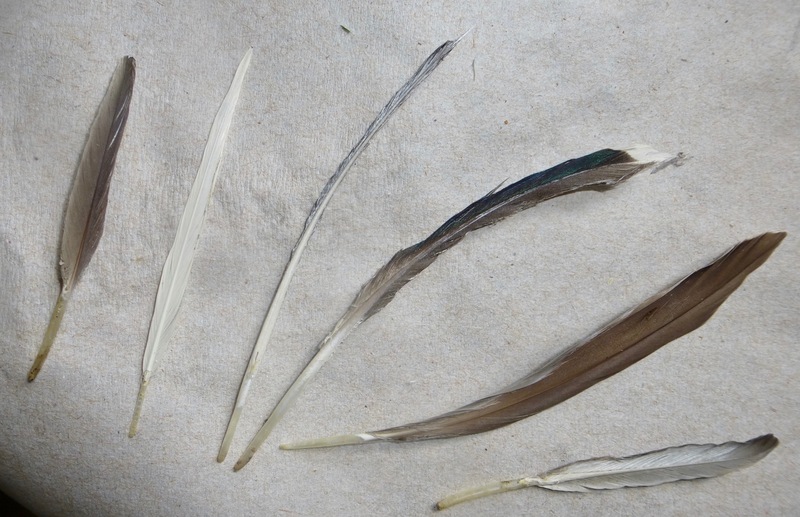 If you collect enough feathers, you can try to create a replica of Honey out of them. You will need to go out to the pet store and get some small weights for them to work out on. Build up for flying. I totally get it, your collecting of Honey’s feathers! I’d be inclined to do that too, if my ducks stuck around all summer. Late spring, they flew off to the nearby creek to nest, once the neighbour’s cat claimed our backyard for his chill out spa. He’s a bird hunter and mouser. 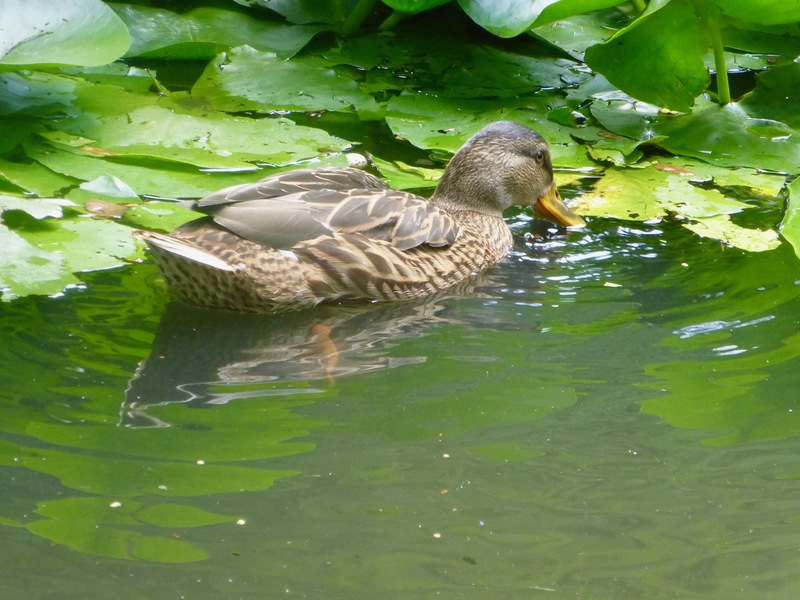 Ducks are so much more refreshing than politicians! If only Trump were a duck. Think we can trade him for one?! A couple of weeks of force-feeding and he would give a huge foie gras. 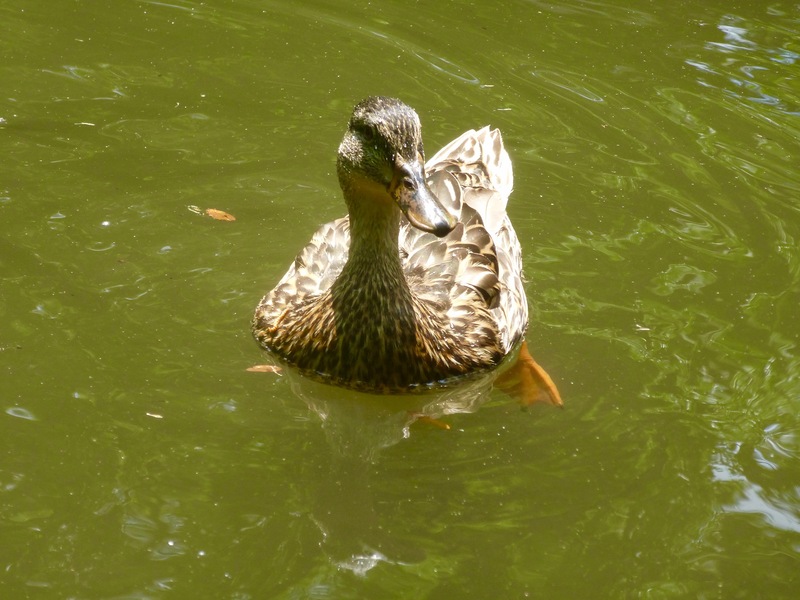 Do ducks do what corvids do in hot weather: sit around with their mouths open?